6 G 2 3rd fretfr. 5 Bb 1 1st fretfr. 2 D 3 3rd fretfr. 1 G 4 3rd fretfr. 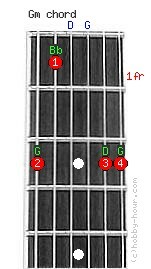 Chord Gm notes: G, Bb, D, G, D and G.
The guitar strings 4(D) and 3(G) are left open. Gmin, G-, (Sol minor, G moll).